Freeport Public Library wants all of the Freeport Area residents to have a library card. 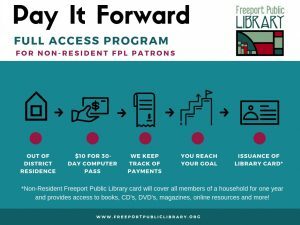 If you live within the incorporated City of Freeport limits, your library card is paid for through your property taxes. If you live outside of the City of Freeport and do not pay library taxes, you are eligible for a non-resident card. The cost of a household non-resident cards is found by calculating the average household cost for library services within our district. This year’s cost per household averages to $92. By law, we must require payment for library services that are equivalent to the cost paid by taxpaying patrons. However, we realize that coming up with $92 on any given day for a library card can be hard to do for many non-resident patrons. That is why we have launched a new program to help you Pay It Forward and get your library card. It’s easy! You can make payments now by purchasing a 30-day computer pass for $10. This gives you 30 days of full access to the library’s computers. When you make your payment, we will record it and when you have reached $90, you can pay the additional $2 and we will issue you and everyone living in your household a full-access library card, good for one year from the date of issuance.